Today on How I Style will be on Crop Tops. 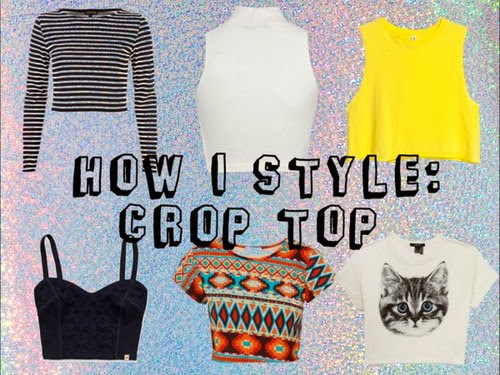 Crop Tops comes in many different styles/kinds/forms. Basically Croptops are just tops that are shorter than the 'normal' length. i dont know why but i like how white & light denim are matched tgt! here again, White & light denim! the opposite one have to be loose/flowy/etc. so here, my top is fitting, so i have my bottom loose. White on white is a very sleek look. if you think the previous look is very boring? just tie a flannel across your waist like how i have done is the past few post! next im wearing this grey scallop crop tank. i feel that the skorts can easily match with any top & making it look presentable instantly! you can never go wrong with a hw jeans with any crop top! so i wont look so... i dont know how to describe! love how slack & casual this is, so comfortable! like i said, you can never go wrong with hw jeans with crops! loose top, & fitting bottom! just my 'playful' look, with a cap that matches with the top! & the trusty old high waist shorts in action. to dress up the very casual look, throw in a 'statement' outerwear! 'show lesser skin' more presentable! time to chill? dress down slightly by tying around the waist again!